If you’re set to have all the family this year or expecting lots of visitors, instead of feeling unequipped and a terrible host, get prepared with a stack of extra chairs, a box full of more glasses and maybe a fancy kitchen utensil so you can churn out a Mary Berry-esque delight! Get your house in the festive mood with spangly decorations and sparkly lights galore! From sets of baubles and wreaths, to Christmas trees and strings of coloured fairy lights – you could even borrow outdoor lights to get your whole neighbourhood feeling the festive spirit! For giggles, laughs and plenty of fun on the big day, why not borrow some fancy dress items and get everyone to wear something silly whilst you play a good ol’ game of charades! Sharing is caring, so if you have any past Christmas gifts that are sadly abandoned within your drawers, the loft or even the garage, dig them out and consider popping them on the app to lend out for a small price. Rummage through your kitchen cupboards to find great pieces of kitchen equipment that now hardly see the light of day, yet were fantastically exciting on the first try! 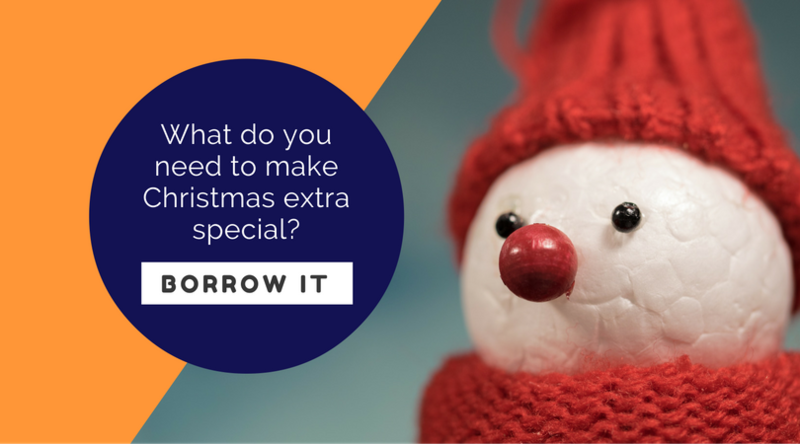 Items like a fondue set or ice cream maker would be perfect for borrowers to share with friends and family at this time of year. It’s the time to party, but if you don’t fancy hosting for fear of the sight of your home the morning after, get sharing those disco lights you only get out for special occasions, along with your vintage sound system to give someone else night to remember.